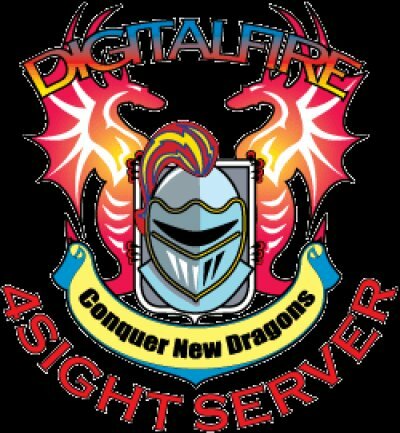 Database software for DOS made by Digitalfire from 1985 until 2005. It was used by ceramic technicians to catalog recipes, materials, test results and pictures in various ceramic industries around the world. It also worked on Windows until Vista (running in DOS mode). Foresight was written first in the dBase interpreter and then in the compiled Clipper language in 1988. It had the ability to reliably catalog large amounts of data (tens of thousands of recipes and materials, hundreds of thousands of test results). It worked on modest hardware and was very fast and efficient. 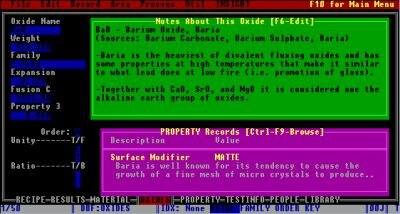 However the DOS interface was a barrier to most users. Function were written to enable export of the data to an account in Insight-live.com (Insight-live catalogs the same type of data, but with much higher capacity and more data types). In this view it was possible to press a function key to pop up a window to enter test results. In that window you could specify the test and specimen and it would provide blanks for all the variables where you could enter the data. Test data already entered displayed in the purple frame and could be edited there. The test results report was also printed from here. This corresponds to the recipe window in Insight-live. This is where you added, edited, searched and deleted recipes as well as entered many different kinds of data associated with them (e.g. for mix tickets, data sheets, change history). It also did chemistry calculations. It was able to order the recipe database in many different ways, a function key brought up a browse (table) view enabling traversal of the list very quickly in the selected order. The information and even the notes could also be edited within browse view. Foresight knew 50 oxides and had a lot of data with each of them. Properties were assigned to oxides. For example, in this screen a Surface Modifier property has been added to BaO explaining how it can be employed to produce matte surfaces. That same modifier was assigned to other oxides and materials. In the properties area it was thus possible to go to matte property and see all the different ways in which a matte could be produced. Foresight knew over a thousand materials and each carried much more data than in desktop Insight. This is where we first accumulated the material information data that now resides at insight-live.com. Material chemistry was stored in percentage analysis in contrast to Insight which stored them as formulas. Thus Foresight has a different chemistry calculation engine. This table view of the data was very fast and flexible way to view many records at once. Notes (3) and individual column items (2) could be edited right from this view. Searching could be done on the code number column (1). The active index (6) could be switched (using the tab key) and the order would change immediately. 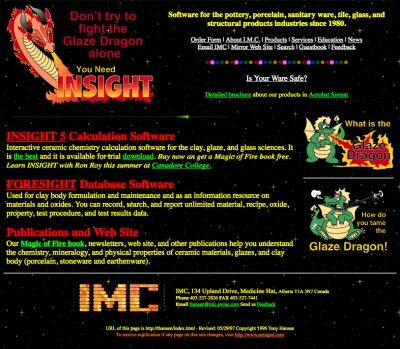 This was a marvelous tool and no equivalent of it is available today. Interestingly, this version is running on a DOS emulator on a Macintosh computer in the middle 90s.